Several Israeli army vehicles and bulldozers invaded, Monday, Palestinian agricultural lands in the al-Kharja area in Battir town, west of Bethlehem in the occupied West Bank, and bulldozed nearly 60 Dunams of farmlands in addition to uprooting 60 olive trees. 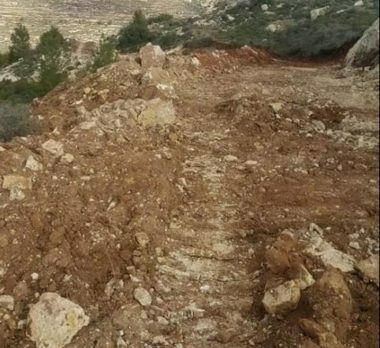 Taiseer Qattoush, the mayor of Battir, said a large military force invaded the al-Kharja area after surrounding it, and bulldozed nearly 15 Dunams of lands, including retaining stone walls, and uprooted 60 olive trees. Qattoush added that the lands are privately owned by two Palestinians from Battir, identified as Raed Abu Hreitha and Riyad Abu Hreitha. The soldiers closed the entire area and prevented the Palestinians from entering their lands while the soldiers were uprooting them. The attack is part of Israel’s ongoing violations against the Palestinians and their lands, including the repeated attempts to build and construct its illegal colonies, in direct violation of International Law and the Fourth Geneva Convention.